A pet food manufacturing plant required a sanitary diverter valve with no cavities to divert their process between two cook tanks. Assured Automation proposed a custom 3 way ball valve package. The assembly included a 3 way, cavity free diverter ball valve, spring return pneumatic actuator and a FM approved explosion proof limit switch. 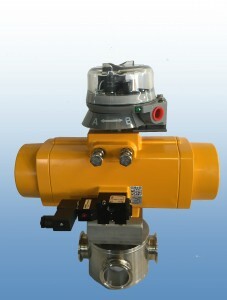 This valve package solved the flow process with one valve and provided the high purity valve design which was required. The L port ensures there are no dead legs where media can collect. This cavity free design is available in 2,3,4, and 5 way port designs. This entry was posted in Custom Projects, Food/Beverage, Latest News and tagged 3 Way ball valve package, cavity free ball valve, Pet food manufacturing valves. Bookmark the permalink.